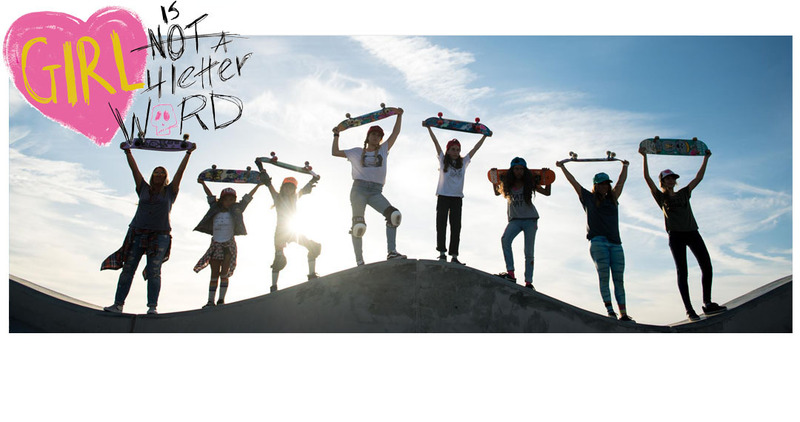 Girl is NOT a 4 Letter Word: Who's Rad? Katherine Beattie. The first day we met Katherine at Venice Skatepark, it was her smile and welcoming attitude that made us come over and say "hi", but within minutes we were watching her launch down stairs, rip fast through the snake run, and pretty much take over the park with some serious riding - so much so that OG skate guys were standing back watching with awe. We immediately wanted to know more about this rad girl with the gutsy attitude. 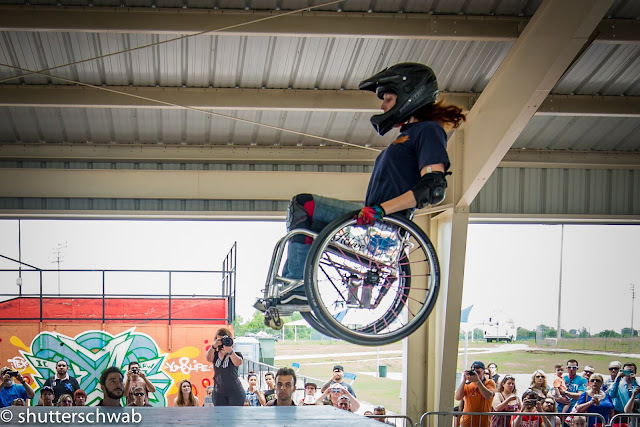 Turns out shredding a skatepark and keeping the boys waiting for their turn isn't all this rad lady does - she is the first female to do a backflip in a wheel chair and she's fighting for gender in equality in WCMX. 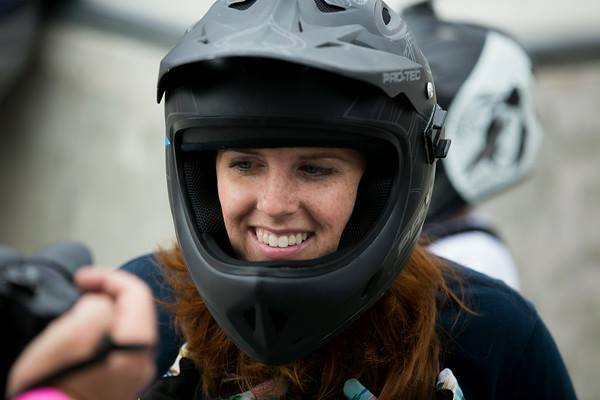 Read on to see what Katherine is all about and why she is leading the charge for girls in WCMX. What got you into doing WCMX? I’ve wanted to do WCMX ever since I saw a picture on Myspace of a random dude dropping into a quarter pipe on a wheelchair. Myspace… I can’t even remember how long ago that was! I knew I’d be hitting skateparks as soon as I had my own chair. Almost a decade later, the stars aligned, I met Mike Box (legendary wheelchair designer and the man behind Box Wheelchairs) and got my first chair. I started riding WCMX right away. Can you explain to our readers what WCMX stands for and what it is about? WCMX stands for “Wheelchair Motocross.” Some people refer to it as Chairskating, but as someone who also skateboards, the two sports have little in common, other than the culture and the stoke. I like to describe it as BMX but on a wheelchair. What is your favorite thing to hit at the skatepark? Bowls are my favorite by far. The drop in, the landing, carving the wall as high as I possibly can. There’s nothing like it. Tell us about the chair you use for your sport – how is it different than regular wheelchair? I ride a Box Wheelchairs WCMX chair in the park. It’s quite the conversation starter, because people aren’t used to seeing such a tricked out wheelchair. My WCMX chair has 4-link suspension with Fox mountain bike shocks at the rear and custom designed suspension casters up front, which really comes in handy if you’re gapping a huge ledge or dropping into a deep bowl. In addition to the suspension it has an adjustable grind bar, bones SPF skate wheels, sport specific Spinergy rear wheels and numerous straps to keep me connected to the chair. Can you trick it out to your own specifications? Every Box Wheelchair is custom designed to fit the rider. A wheelchair should feel like an extension of your body, so a proper fit is paramount. 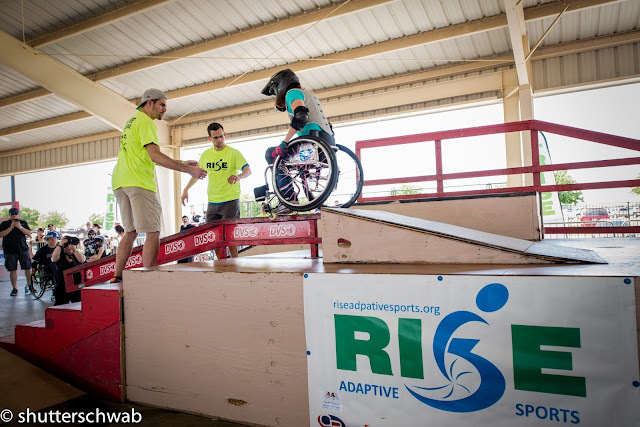 In addition, in a sport like WCMX different disabilities or conditions will require a different set up. In my case, we went through 4 different grind bars before finding one that worked with my Cerebral Palsy. I use Spinergy Wheels Flexrims instead of a standard pushrim since I have somewhat limited hand function. In terms of color and style, everyone is different… but if you ask me, I have the best looking wheelchair out there. I get compliments on it almost every day! Can this same chair be used for everyday use as well, or is it sport specific? The same chair can absolutely be used for everyday. The first wheelchair I ever purchased was a WCMX chair. I used that in an out of the park until I got an everyday chair 2 years later. 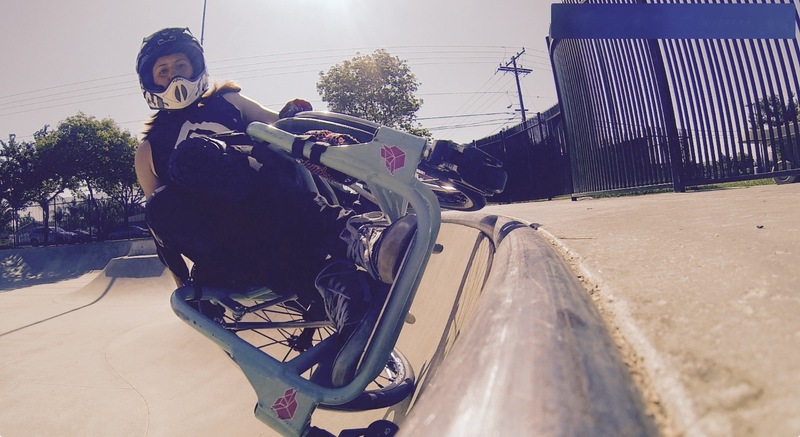 WCMX chairs tend to be heavier than everyday chairs, but they’re still a great ride! You joined the Adaptive Action Sports Team for both skateboarding and WCMX – tell us about your skateboarding skills and what boards you ride? I was super into board sports growing up. When I was about 11 years old my twin sister got a skateboard from a skate shop in town, and when I tagged along my dad bought one for me as well, not knowing I couldn’t skate! I quickly taught myself to use one (I thought I was really good, even though I could really only cruise) and skated almost every day for the next 2 years. At 13 I had a very common surgery for kids with CP – hamstring lengthening – and to my dismay I never fully recovered. I was once again unable to skate, but it always stayed with me. Exactly 12 years later, to the day, I attended an event called “They Will Skate Again,” with the Life Rolls On Foundation. There I met Jim “Red Dog” Muir, and he basically stood me up and held me as we skated around the park. I knew then and there I had to get back into it, but Jim wasn’t always going to be around to help me. I decided to get the biggest board I could find, the Dogtown Bigfoot, and started skating on my knees using my hands to push. A year later Jim gave me a Dogtown Bigboy that he was personally riding. I still have both boards and will always ride a Dogtown in honor of Red Dog! Things are changing rapidly for girls in every sport – what about WCMX – any developments you have seen that are positive for the girls? As a young sport, WCMX is changing rapidly. When I first started there were one or two other girls riding. 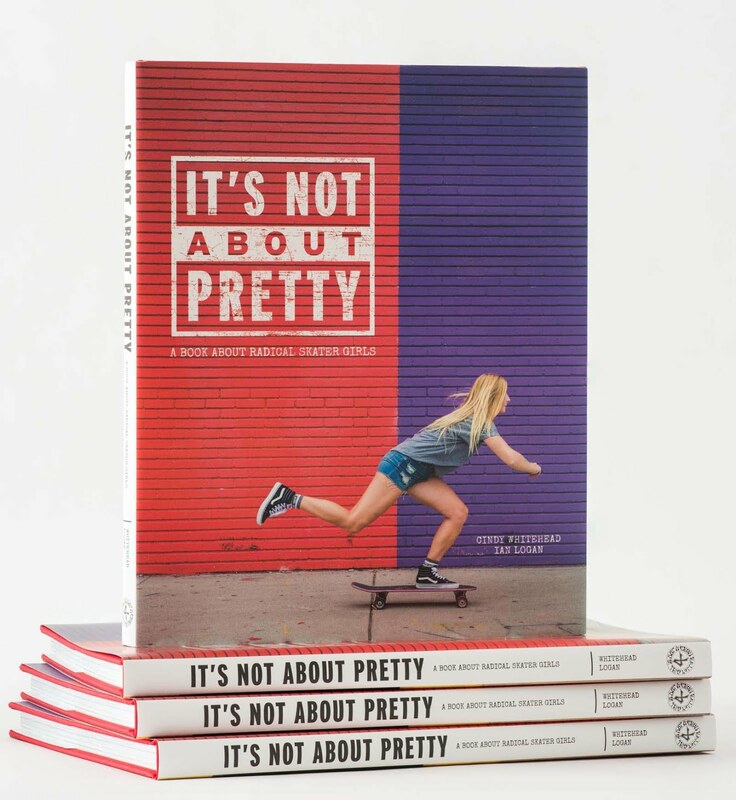 Now we have 10 that ride at a competition level and countless other girls as young as 4 years old that are getting out to skateparks on a regular basis. 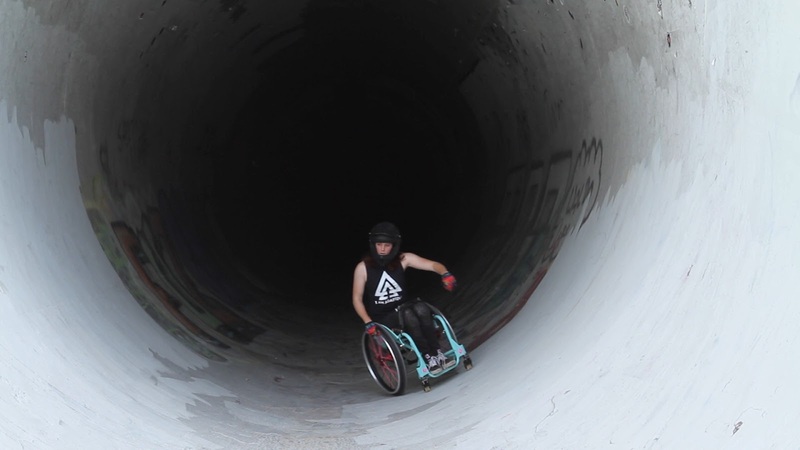 WCMX is no longer seen as just something for the guys. Girls are learning they can get out there and be just as extreme! 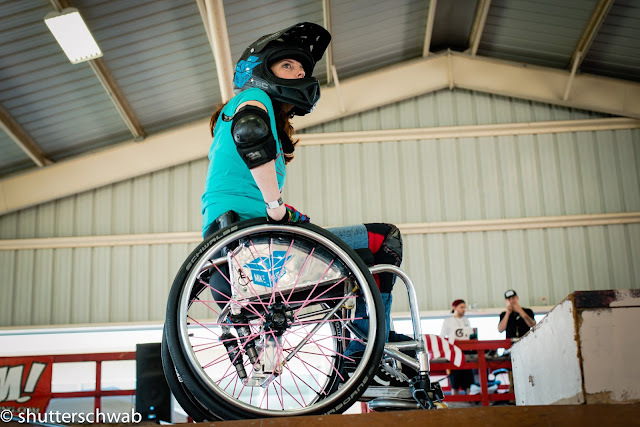 What advice can you give to girls who may be starting out or want to try WCMX ? Just do it! Even if you don’t see yourself competing on a national stage, WCMX is the best way to learn essential chair skills in a safe environment. All you need is a helmet, pads, a little courage and a friend to help you until you get comfortable. Don’t let the skatepark culture scare you away. You may be nervous at first, but once you get there you’ll see skaters will treat you just like anyone else on four wheels. We’re all there to grow and to support each other, regardless if the wheels are under our feet or under our butts! 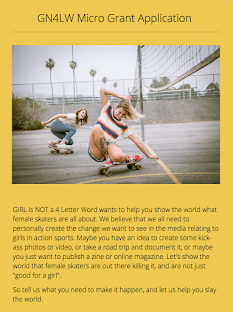 You are an extremely positive role model for girls out there, and in addition to that you have been filming and competing more and more lately so we’d like to talk to you about all that. Some athletes compete or just film, and some do both – what are your preferences? I love competitions because it gives the WCMX riders a chance to spend time together. As such a small sport that’s spread out over multiple continents, getting to ride with someone else who uses a wheelchair is such a rare treat, so spending an entire weekend with friends and learning from each other is worth all the competition stress. For me though, it’s not really about winning competitions, it’s about getting out to the skatepark as much as I possibly can, and pushing myself a little harder each time. That’s why I love to film, because it gives you a record of your personal progress and achievements. And I always feel like I ride better when the camera is rolling! You are always filming and posting great videos from your park sessions – any tricks you’d like to share with our readers on setting up your iphone to shoot when you don’t have someone else to help? I have a little piece of aluminum pipe with a notch cut into it that keeps my phone steady on the ground. I’d love to get some better equipment, but for now it does the trick! You have to get pretty creative with camera angles, and it’s not uncommon to see me out of my chair crawling up a quarter pipe to set my phone at the best possible vantage point. You have also been to Woodward West a few times – what was that experience like? Even though I’ve been to Woodward West multiple times now, I really can’t put into words what it’s like. I have dreamed of going to Woodward ever since I was 12 years old. I never made it as a camper, but when I got the invite from German WCMX Pro David Lebuser a few summers ago I freaked out. In my line of work we don’t have vacation days, so I went to my boss and pleaded with him to leave early, telling him he really couldn’t possibly understand what an opportunity this was. He graciously let me go, and when I got there I was immediately 12 years old all over again. Woodward West is pure heaven. I feel like my heart is going to explode with excitement every time I’m there. There are just so many things to try and new ways to challenge yourself. And for WCMX riders, they have the all important FOAM PIT! When you’re strapped into a 30+ lb piece of metal, there’s no bailing out of tricks, so if you want to try something extreme, it’s gotta be in a foam pit. You are a total trailblazer – you are the first woman to do a backflip in a chair –that is BADASS! Tell us about that! When I picked up my first wheelchair from Mike, he told me he made the frame an inch longer so I had space to grab when I was the first girl to land a backflip. Outwardly I thought, “okay Mike, yeah right!” but inside, there was nothing I wanted more. At the time there were only 2 guys who had ever landed the backflip, one being Aaron “Wheelz” Fotheringham, and the other Darryl Tait from Canada. The thought of joining such an exclusive club was really exciting. I first tried it during my aforementioned first trip to Woodward West. I thought it wasn’t going to be that difficult. You just go fast and pull back. Well… it’s hard. It took me 7 hours and over 20 attempts (which involved crawling up stairs and out of foam, and eventually being dragged out after I got too tired) to get the full rotation. Getting that first flip to foam was a feeling I’ll never forget! I had another opportunity to practice that Christmas at Daniel Dhers Action Sports Complex in North Carolina. That time it took 2 days to get the rotation. Then, eight months after my first attempt, I went back to Woodward with fellow riders Blake Simpson and Rico Reyes. Blake is such an amazing rider. He did a flip to foam, decided it was too hard to crawl out and went straight to resi. He got it first try! I knew then and there I was going to get the flip that day. I did three attempts on the resi, and with each one I got farther from landing it. After the third I knew I was going to start hurting if I didn’t go again right away, so I hurried back up the roll in, hucked it and could not believe when I landed wheels down instead on my face. I immediately started crying with excitement, relief, pride and so many other emotions. All the work to get there was so worth it. We all ended up landing flips that day! I know you and Jamey fought hard for a women’s division at this years WCMX Championships – can you tell us why this was so important? I had been the only girl competing (in WCMX and Adaptive Skateboarding competitions) for several years. Each time the reaction was the same. People couldn’t believe there was a girl out there. I love competing with all my guy friends, but I had to wonder if the sport being so male dominated was scaring other girls away from competing. I basically forced a couple girls into competing with me here and there, but I knew if we could get an entire division to ourselves the sport would take off. Having a chance to compete against people of a similar skill level, girls or guys, is a huge confidence booster to everyone. 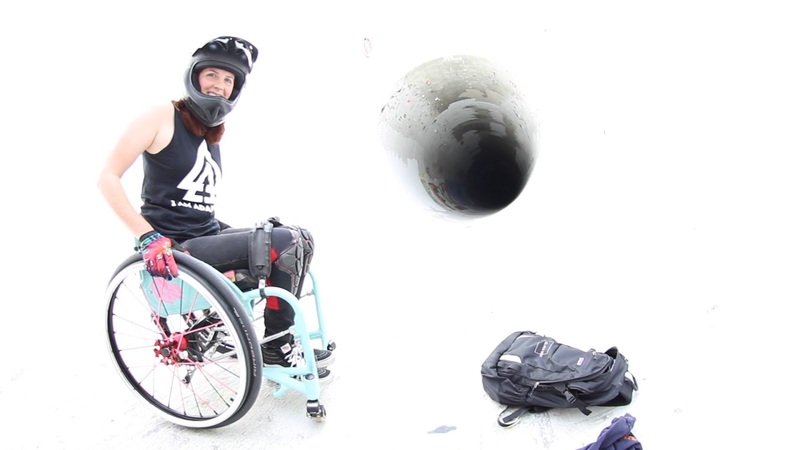 Now people are seeing that WCMX is a sport girls can do -- and excel at -- at a high level, not just A girl who is willing to get out there with the guys. You had an accident trying your backflip at the championships – can you share what went wrong and how you dealt with it? Sure. WCMX has exploded as a sport over the last year or so. As a result we had 4 different divisions at the championships! Huge, right? Since there were so many people competing, they combined the beginner, intermediate and women’s practices into one session. I knew I wanted to practice the flip before the contest since the ramp as new to me, and very sketchy. Practice was crowded with tons of little kids. I saw my opportunity, went for it, but halfway down the ramp I knew I had done something wrong, because I was going across the flat in a wheelie. I remember intense pain, blackness and then waking up lying on the ground with my whole body feeling like it was on fire. I watched a video later and saw that I grabbed the front of my frame while I was still on the roll in (probably because I was distracted and the ramp was different, but who really knows? ), which caused me to go into a wheelie and hit the back of my head on the quarter pipe, landing with my lower spine on the lip of the ramp. I was diagnosed with a concussion, but thankfully all CT scans and x-rays for any breaks in my spine came back clear. 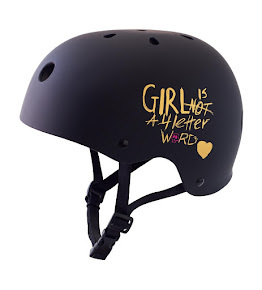 If I hadn’t been wearing my Kali Protectives helmet I probably wouldn’t be here now, so wear your helmet, girls! While I’m now fine, physically, mentally and emotionally the recovery has been painfully slow. Working for an entire year to get to this competition, and having it be the first girls competition that I’d been pushing for for years, and not being able to participate was soul crushing. I can say with complete honesty I wanted to win, but I’m not upset about not winning. Just being forced to sit out of a sport I love and an event I was so looking forward to because of rider error is still too much to think about. Any things you’d like to see change in the sport? Now that we have enough girls competing at a high level to have our own division, I’d like to see WCMX girls be treated just like the guys. 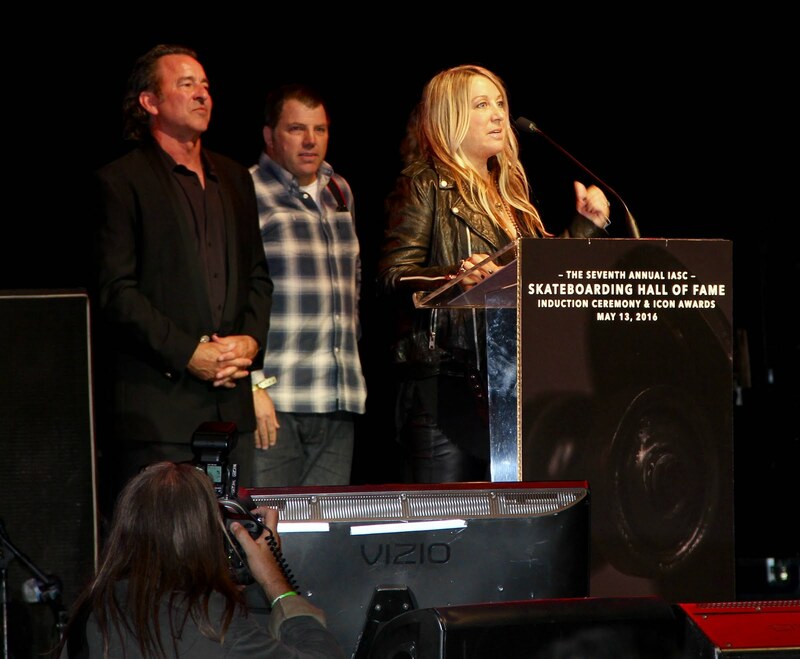 None of the prize purse was allotted to us like it was the WCMX “pro” (mens) and adaptive skate competitions. I had to go out and personally hustle up prizes from some very generous sponsors and friends in the skate community. We were told we could compete with the “pros” if we wanted a chance at prize money, but that’s not the point. I know this is a refrain heard over an over again in women’s action sports, and WCMX is the next frontier. You are always on the go – traveling, hitting up skateparks, working, learning new tricks – how do you keep in shape & what is your healthy secret for food choices? Health and fitness are very important to me. I lift weights 5 days a week, work out with a personal trainer weekly, and add as many skatepark sessions as my aging body can handle. When you have a disability there’s a fine line between pushing yourself and overdoing it, so I try to pay attention to those days when I need to rest as well. I’ve been Vegan for 6 years. People always wonder where I get my protein, but if you eat a balanced diet of whole foods (fruits, vegetables, legumes, nuts/seeds and some grains – forget anything that comes in a box) your nutrition will stay on point. Finding something to eat can be a struggle, especially if you’re traveling to competitions, so I try to remember to bring fruit, nuts, meal bars, anything that will give me a quick burst of energy. You have been to quite a few skateparks - can you tell us some of your favorite places you’ve gotten to ride? Number 1 has to be Woodward West – a world class facility with amazing staff and new ways to challenge yourself every trip!I’ve also been given the opportunity to ride The Berrics a few times, and it’s like Steve and Eric built that place for WCMX! My favorite parks in town are Sheldon and Venice, but by far the most wheelchair-friendly park we’ve found is Fontana South. We’ve renamed that the Fontana WCMX park. I love to get out and try new places. Palm Springs, Encinitas, SLO, Oxnard… if it’s within a day’s driving distance round trip, I’m there! The most interesting place I’ve ever ridden is the Mt. Baldy Fullpipe. My friend told me it involved “a bit of a hike” to get there. After feeling like I was in The Goonies or Stand By Me for like an hour it appeared in the distance, but when I got there I found out the only way to cross this 6 foot gap was a rickety piece of wood. Let’s just say crossing that without using my legs and watching my buddy carry my very expensive wheelchair across it after me was very stressful. What are your plans for competing in the upcoming year – any contests or filming or photo shoots you are looking forward to? I’m coming off a rough couple of years, so I’m always trying to find the next thing to look forward to. My dad died 2 years ago, and last year on the anniversary I released a WCMX video that I’d been working on for a few months. Since I love filming, I want my next edit to be an all girls WCMX video. Backflip! It’s hard to explain, but I completely black out for a split second in the air. It’s so disorienting. Seeing your wheels come back under you and landing it is such a rush! I also love grinds because they’re such a challenge. I usually get pretty worked trying a new rail, so finally landing feels incredible. I don’t have any official sponsors, but I’ve been hooked up with some great gear from Kali Protectives, Supracor, G-Form, Dogtown Skateboards and Box Wheelchairs. I’d also like to give a special shout out to Kali Protectives, Supracor, Bones Wheels, Adaptive Action Sports and Sports N Spokes for their generous support of our women’s division at this year’s championships by donating the prizes for our competitors. Can you tell us about the setup you ride and why it works for you? I ride a Box Wheelchairs WCMX chair. In my opinion it’s the best chair on the market, and the only one proven to stand up to the Nitrocircus Mega Ramp! I also use Spinergy Wheels Flexrims, Bones SPF 60mms, Bones Swiss bearings, and a Supracor Sport cushion. Box Wheelchairs are the best because they’re custom fit to the rider, and if something’s not working for me I stop by the shop and they won’t stop working till it’s right. What are your favorite things to do when you are not tearing up the skatepark? I’m a television writer, so most of my down time revolves around that. Writing scripts, watching TV, binging on Netflix. I also love to explore. I recently went on a solo road trip up through Big Sur and am already looking forward to my next adventure! I don’t read enough! The last book I read was The Curious Incident of the Dog in the Nighttime. Three things you don't know about me? 1. Broccoli is legitimately my favorite food. People think I’m lying. 2. I was all set to try out for the US Paralympic Skeleton Team until I remembered I hate cold weather. 3. I have a twin sister who is 8 inches taller than me. If we’re both standing people don’t even think we’re related, but if I’m on my wheelchair they immediately ask if we are twins! Life Rolls On They Will Skate Again – July 16th at Venice Skatepark! I’ve also recently gotten back into surfing, so on my off weekends I have lots of surf sessions planned, with the goal of one day making the US adaptive surf team. Don’t let fear hold you back from anything. Fear is what makes it worth it!